I love the texture for her body, but I am sick of french knots now! The dark blue and green french knots are Corticelli twisted silk – a present from the wonderful Monique. Thanks SO MUCH Monique! It’s really making this project look good. I will be using it on her skirt too, though I think I’m done with french knots for this project. 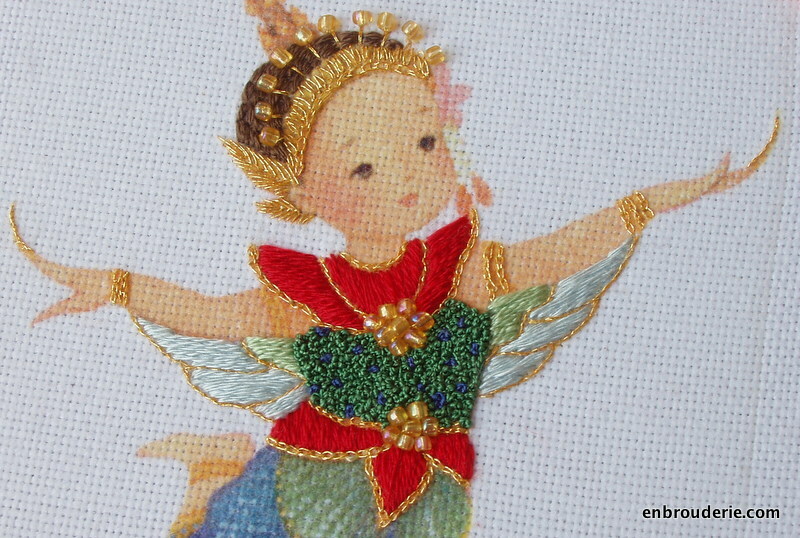 The wings, hair, and the red sections are Kreinik silk mori. Her hair is worked in double running stitch. You can see the crown starting to come together. The gold accents really stand out! 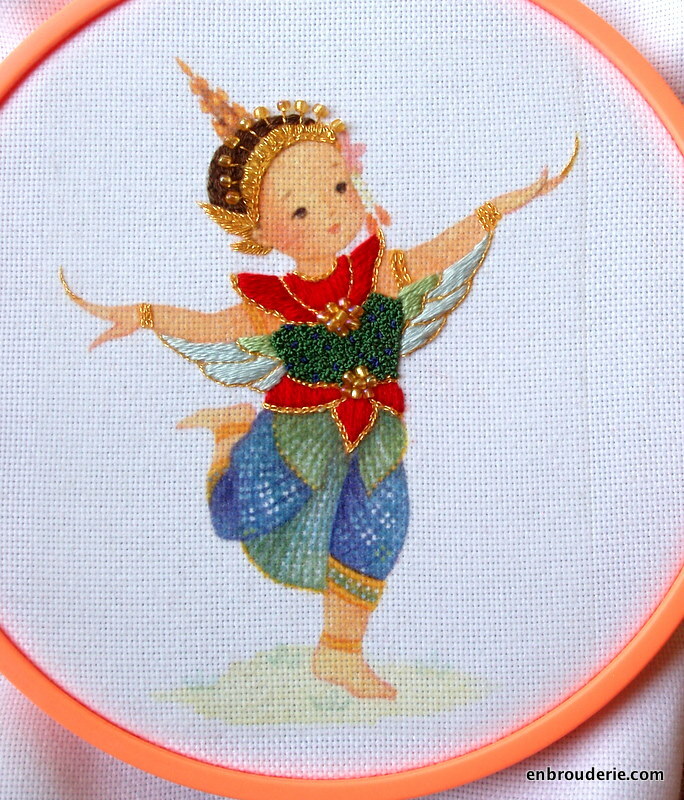 This entry was posted in My work, Surface embroidery and tagged embroidery, french knots, silk, thailand. Bookmark the permalink. Lovely…know what you mean about french knots. I used french knots totally to make an Interstate 69 sign on my TAST 2012 Sampler to represent our trip North from Alabama this spring. I don’t care if I ever do another french knot again. Think I’ll stick to Colonial! 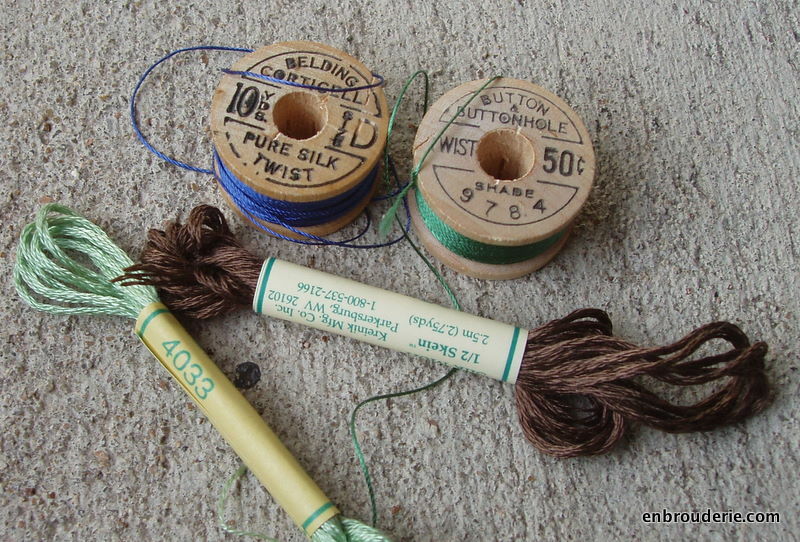 sources for the corticelli silk twist. I honestly don’t really know – I think they’ve been discontinued for many years? You could try ebay or etsy. I am sure other companies sell silk twist too. I doubt they cost 50 cents any more though. It was worth the effort, but I can understand how tired you must be of French knots! Yup! Glad it’s a tiny project! Your embroidery is just beautiful. I envy you, I cannot see the stitches even with my thick glasses! Oh man, sarees are pretty big! Sounds like some project! Oh wow! this is delightful! I think the texture on the body was well worth the effort of the many french knots and the crown is just lovely.